Free access for developers and admins to perform a full CRM snapshot data creation for testing or data migration, backup and recovery. DBSync, popular Data Management Platform, today launches new Developer edition for Cloud Replication designed to help developers and admins test their projects for free. The new Developer edition allows developers replicate, backup and restore data to ensure it is secured and complied with legal regulations. The tool provides notifications on the most critical information, alerting users when action is needed and orchestrating the automation of routine tasks with scheduler functionality. “By creating Developer edition for our Cloud Replication tool, DBSync promotes organizational data agility and security,” said Rajeev Gupta, DBSync’s Founder and CEO. "The tool updates and backs up the data automatically minimizing human interference and maximizing its correctness. We care a great deal about data accuracy and security and invite developers to test the tool firsthand!" For a full list of features and a video demonstration, visit Cloud Replication. 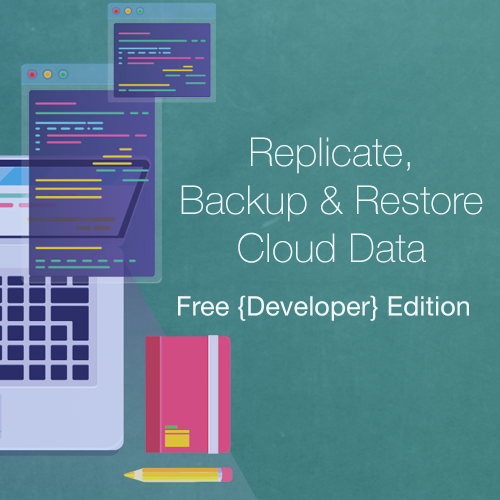 To sign up for a free Developer account, go to Cloud Replication and CDM Developer Edition. DBSync is a leading provider of data management, replication, and application integration for CRM (Salesforce, Microsoft Dynamics 365 and more), Accounting (QuickBooks Desktop and Online, Microsoft Dynamics GP & NAV), Warehouse Management Systems such as SkuVault, popular databases (Oracle, SQL Server, MySQL, MongoDB, S3 and more), and data integration markets. With easy to use pre-built maps and powerful Extract, Transform, and Load (ETL) capabilities, DBSync enables users to easily link information between leading Cloud and On-premise based CRM, hospital asset and case management, and accounting applications, along with support for on-premise applications running databases. DBSync provides support, training and consulting services for its integration solutions and is headquartered in Nashville, Tennessee, with centers in San Francisco, CA and Bangalore, India. For more information on the Data Management Platform, please visit, DBSync.